We are headed to Isla de Guadalupe, Mexico on the M/V Southern Sport to dive with the king of all sharks - the great white. Located in the Pacific Ocean, approximately 165 miles west of Ensenada, Mexico. Guadalupe Island is the best place in the world to see great white sharks underwater. The island has a large population of white sharks that annually visit these waters, thanks to the thousands of Guadalupe fur seals, California sealions and northern elephant seals that call the island home. With over 100 plus feet of visibility, the water here is every Shark photographers dream...crystal clear conditions and big toothy sharks. Other wildlife that can possibly be viewed during our dives; makos, blue sharks and yellowfin tuna. This expedition uses surface supplied air (hookah) instead of scuba tanks, so this cage diving adventure is OPEN to non-certified divers also. $3,290 per person with a $500 deposit to reserve your space. - All meals, snacks, soft drinks and some alcoholic drinks (domestic beers, wine). We use two surface cages, and each cage can hold up to 4 divers. Throughout the day we will rotate divers, (every hour), all day long. Giving everyone equal opportunities to spend plenty of time with the white sharks. We use a hooka line set up (surface supplied air), so you do not need scuba tanks, which allows more freedom and movement inside the cages. Because we use hooka lines, this expedition is open to both certified divers and non-divers. Uncertified divers unfortunately are restricted to the surface cages only, while certified divers can experience an exciting and unique perspective from the safety of our submersible cage. 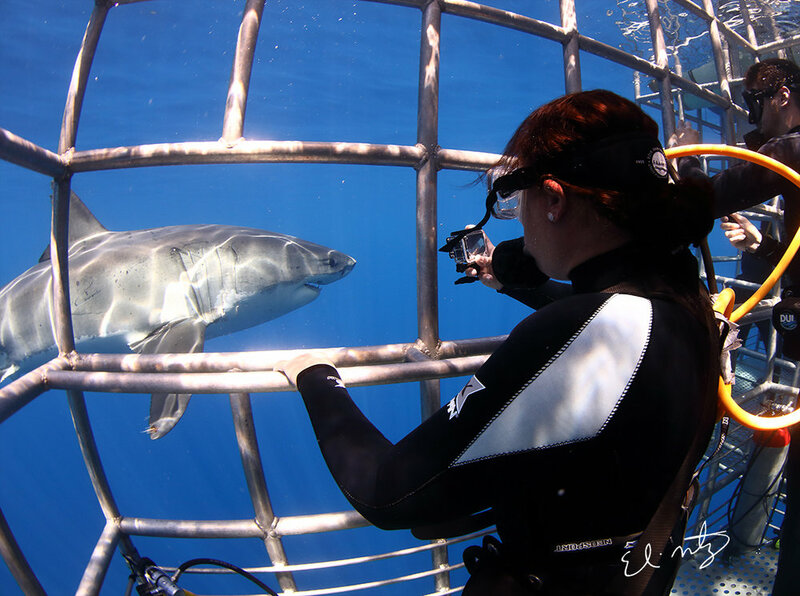 In this cage, we can lower four of our divers down to 30 feet where they can view sharks from an entirely different perspective. Day 1- Pick up from our host hotel (Hampton Inn) in San Diego at 8:00 a.m. We will drive you down to the marina in Ensenada (1 1/2 -2 hrs), where the boat is docked. Our expedition vessel for this trip is the M/V Solmar V. A 112' Luxury Liveaboard Dive Vessel. Boat departure is at 1:00 p.m. Once we depart, we will navigate for the rest of the day and night to Guadalupe Island. Day 2 - Arrival at Isla Guadalupe is early in the morning, cage deployment and “chumming” are the first tasks of the crew, cage diving begins as soon as the first Great white shows up. Diving for the rest of the day. Day 3 - Cage diving all day. We will run 45 minute rotations throughout the day, giving everyone an opportunity to spend plenty of time with the great whites. Everyday is different, some days the great whites want to play other days they just show up for brief moments. However, in September, there are plenty of white sharks that migrate through, so there are plenty of opportunities to see a lot of different great whites throughout the day. On day’s (two and / or three), we will take a panga ride to tour the shoreline for an opportunity to photograph the countless, California sealions, elephant seals and Guadalupe fur seals, that are everywhere, along the coast lines. The Guadalupe fur seal is endemic to the island and can only be found here. The Guadalupe fur seal was almost hunted to extinction, but thanks to protection, the population has rebounded and now these charismatic seals pepper the coast. These rides are opportunities to see the beauty of the rugged Guadalupe island coastline up close and personal, and is breathtaking. The white sharks have learned how to sneak up on the hang baits and will often breach as they attempt to steal away the bait from the shark wranglers. These are great opportunities to capture unique footage of white sharks hunting. Day 4 - Cage diving during the morning and small part of the afternoon, the crew will start pulling the cages out of the water at 3:00pm After the cages are lifted, we begin our journey home. We motor all night and return to port the following morning. Let us know you're interested in joining our 2019 expedition. Thank you for your interest in our Great White Shark Expedition. We will send you more information on this trip. If you have any immediate questions, regarding the expedition, please feel free to call us, or send us an email.